The Flak Jacket XLJ to give larger faces full coverage. Sport professionals demand nothing less than the best, and Oakley has answered their challenge for decades. World-class athletes have driven them to create innovation after innovation, including interchangeable lens designs with unbeatable optical clarity. Flak Jacket takes that to the next level with the latest in performance technology. The Flak Jacket XLJ to give larger faces full coverage. Sport professionals demand nothing less than the best, and Oakley has answered their challenge for decades. World-class athletes have driven them to create innovation after innovation, including interchangeable lens designs with unbeatable optical clarity. Flak Jacket takes that to the next level with the latest in performance technology. Flak Jacket features Oakley Hydorphobic and Oleophobic treatment, a permanent lens coating that prevents rain and sweat from building up on the lens. It also repels skin oils and other contaminates, so the lens is smudge resistant and easy to keep clean. It even eliminates static electricity, so dirt and dust particles won&apos;t cling. Flak Jacket lets you change lenses in seconds to optimize vision in any sport environment. Multiple lens colors are available, and all lenses feature the unbeatable clarity of Oakley&apos;s High Definition Optics (sold separately). Choose the nose pads that give you the best fit, two sizes are included with every frame. Like the stem sleeves, they&apos;re made of Unobtanium to increase grip with perspiration. 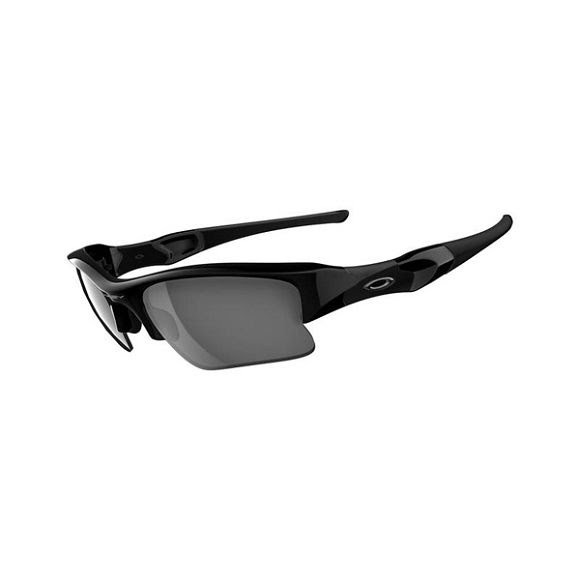 Oakley&apos;s Three-Point Fit optimizes comfort and holds the lenses in precise optical alignment for superior clarity. Flak Jacket is made of lightweight O Matter for all day comfort. Pure Plutonite lens material filters out 100% of all UV, and FLAK JACKET meets ANSI Z87.1 standards for impact protection. The semi-rimless design means there&apos;s no frame rim to block downward view. Optical clarity exceeds all ANSI Z87.1 standards, and XYZ Optics extends razor-sharp vision all the way to the lens periphery. An excellent all purpose high contrast lens for sunny days, the Black Iridium transmits 18% of visible light, increases visual acuity and reduces glare. HDO lets you see clearer, sharper and without the magnification of ordinary lenses that act like prescription optics. You see everything exactly where it is, not shifted like the view from inferior lenses. You get the unrivaled impact protection and 100% UV filtering of the purest lens material on earth. Plutonite filters out 100% of all UVA, UVB and UVC. Protection is built in, it&apos;s not a coating that can wear away. Our lens contours help block UV at the top and sides for more complete protection. Impact resistance against heavy objects at low speeds. Impact resistance against lighter objects at high speeds. Optimized protection with innovations like Plutonite lens material. Optical alignment for sharp, accurate vision. Impact absorption for improved safety. Geometries that extend peripheral view. Oakley&apos;s unique Hydrophobic coating makes lenses immune to moisture buildup, and thatÕs just the start. Oleophobic anti-smudge technology repels oils and contaminants that can corrupt your vision in the heat of competition. Soft, conforming and comfortable Unobtanium&apos;s grip tightens as you perspire for a bombproof fit.